Ifrah grew up on the outskirts of Gondar. Her father left shortly after her birth, leaving her mother to work long hours as a cleaner to provide for her family. But a cleaner’s salary was never enough, and so in a desperate attempt to provide food for her daughter, Ifrah’s mother moved into a profession too many young Ethiopian women become trapped in – prostitution. Devastatingly, in 2012 Ifrah’s mother contracted HIV and passed away shortly after. 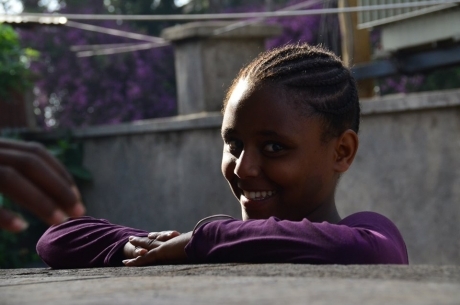 Ifrah became one of more than 800 young and vulnerable children living on the streets in Gondar. For children like Ifrah, life on the street is a grim reality. Hunger and disease are daily battles, and children must resort to criminal activity or begging to survive. Gondar is becoming a hotspot for predators enticed by a high population of street children, exposing girls like Ifrah to pregnancy, HIV and violent physical and sexual abuse. In 2013, Yenege Tesfa’s founder, Nigisti, found Ifrah and offered her the chance to change her life. Nigisti invited Ifrah to be part of their Homes for Tomorrow program: houses that provide vulnerable children with the long-term care and support they need to build a bright future. Ifrah was given her own bed and new clothes and shoes. Within just a few weeks her health had improved and she now attends school daily. She speaks a lot with her ‘house mother’ and ‘big sister’ about her experiences on the street, and together they are helping to rebuild her confidence. But most importantly, for the first time since her beloved mother passed away, Ifrah feels safe again.